Great for selfies. Microsoft's Lumia 735 is a good middle-class smartphone with decent cameras on both sides and a comprehensive set of features. 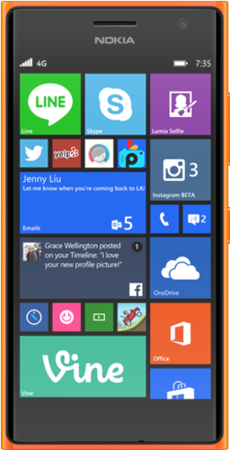 The bold colors, which are common for the Lumia-series, make quite a statement as well. We all thought that the Microsoft Lumia 640 would be the posterchild for the affordable segment of the Windows Phone camp, especially when its presence was in full force during Mobile World Congress 2015. After checking out the Microsoft Lumia 735, however, we have a change in heart because this feels more like a fitting candidate. Aesthetically, we adore the classic Lumia styling, as it features removable rear casings that are available in an assortment of color ranges – conjuring up an upbeat, cool design. Verizon’s last Lumia smartphone was the Lumia Icon which was released in February of 2014, almost a year and a half ago. The Lumia 735 is not exactly a worthy replacement, but it’s better than nothing. Honestly, the Lumia Icon could still best many of the other phones in Verizon’s lineup today, especially with the Denim update it recieved in February of 2015. Even if you’ve got an older Lumia 928 on Verizon, the Lumia 735 would mostly be a downgrade for you. Unfortunately, Microsoft has been concentrating on releasing budget friendly smartphones these days, so we’re not seeing anything spectacular here. There's a slight bump in the road coming for the Lumia 735, with the newly Microsoft-rebranded Lumia 640 and 640 XL going on sale in the UK. While the Lumia 640 is only around £40 cheaper at around £130 and including significantly cheaper components, the 640 XL might pique some buyers' interests. The 640 XL is significantly larger than the Lumia 735 at 5.7in and while you don't get any extra pixels and therefore a much lower pixel density of 259ppi, its £186 retail price makes it one of the cheapest supersized smartphones on the market. For the most part, Nokia’s Lumia 735 is a decent little mid-ranger that performs quite well and offers the megapixels for someone who really loves a selfie or two. The battery life is one of those things totally worth noting, too, with two days no problem for the average user, and a solid day for the power user. If selfies and battery life is what you’re after, we’d take a look at what this phone has to offer, if anything just because it’s also likely the last “Nokia” branded phone you’re likely to see. The first question is easy. The Nokia Lumia 735 is a fairly decent phone that does well in many areas. 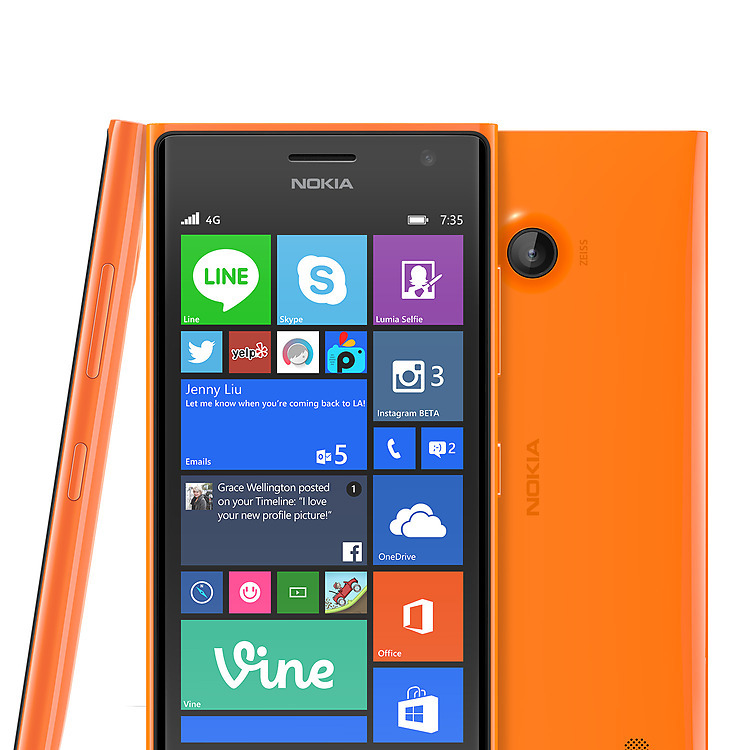 The Lumia 735 is well designed, the materials used make the handset feel great in the hand and look nice as well. It doesn't venture far from the standard Lumia design, and as far as I'm concerned that's a good thing because not every mid-range device is tough, dependable and also reasonably stylish. Ideally this handset would be a little slimmer and more compact, but it is what it is. Sitting alongside its Lumia 830 stablemate in terms of power, the Nokia Lumia 735 mixes things up in the camera department, making a case for the presence of these two similar devices. Camera performance from both front and back snappers is good, even if the Lumia Selfie app is currently flawed. The selfie is one of the biggest trends and phenomenons of the last 12 months and the Lumia 735 is aimed at those sharing their daily outfit and best pout. The phone is one of the mid-range Lumia smartphones and costs £189 which is almost budget. 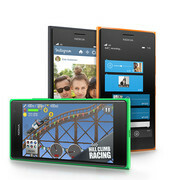 Microsoft is doing well to shake things up in the Lumia lineup. A couple of devices shown at IFA in September have hit the shelves and, the software boost courtesy of Lumia Denim aside, the lineup is being updated in the right place. The upgrades are even slightly overdue perhaps - busy adding a tablet and a couple of phablets to the lineup, along with dual-SIM support and cheap screen real estate, Nokia and Microsoft somehow overlooked the midrange. HTC Desire Eye vs Nokia Lumia 735 comparison: What's the best smartphone for selfies? We don't need to tell you that the HTC Desire Eye is the better phone in this comparison. Of course it is. After all, it's nearly twice the price of the Lumia 735. In its screen, in its hardware, in its storage, in fact in every category the HTC beats the Nokia. But while the HTC clearly has the better selfie camera tech, you could argue that Nokia's selfie software is easier to use without going too far and, given the lower price, we reckon it'll be more appealing to its target market. Both phones, though, will help you take a much better selfie. The Nokia Lumia 735 is solid Windows Phone-powered blower, but you don't get a ton of bang for your buck. With a price-tag hovering around £189, it doesn't offer that much value compared to the current king of budget smartphones, Motorola's latest Moto G. Its selfie-orientated front-facing camera is great, but it's certainly not a must have, and you might just find yourself wishing you had more apps to play with. 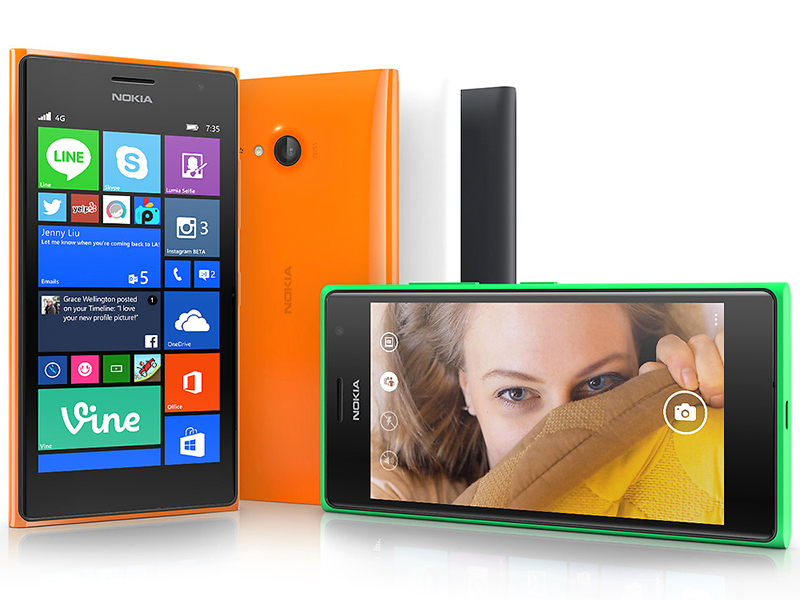 Nokia might be pitching the Lumia 735 at the selfie fan, but in doing so it misses a potentially larger market. Well-built with lots of app extras, an operating system which is become more user friendly and flexible, and higher-end features like wireless charging, 4G and NFC to its name, the Lumia 735 is, for this reviewer, the best of the lower cost Lumia range. Indeed, it's a pretty good sub-£200 buy across the board. We don't need to tell you that the HTC Desire Eye is the better phone in this comparison. Of course it is. After all, while we might not know the exact UK pricing, we expect the Desire Eye to be around double the price of the Nokia Lumia 735. In its screen, in its hardware, in its storage, in fact in every category the HTC beats the Nokia - except one: selfies. While the HTC has the better selfie camera tech, we think the Nokia has the better selfie software and, given the lower price, we reckon it'll be more appealing to its target market. The most fun Nokia on the market, the Lumia 735 really is an ideal smartphone for selfies. At just £189 we can picture many a teenage girl - and boy - adding this great-value Windows Phone to their Christmas list. Given the low- to mid-range price its performance is sufficient, and we appreciate the extras such as microSD support, Qi wireless charging and 4G LTE. We just hope the Lumia Denim update fires up that camera a bit quicker. There are plenty of good reasons to consider it, particularly at its sub-£200 SIM-free price. It has two good cameras, it looks smart and there lots of things to like about Windows Phone if you spend a little time with it. We prefer it to its most immediate Android alternatives, such as the Sony Xperia M2. A very good phone for sharing photos, but less so for games. But if you don't play games there are few reasons not to buy one. It’s almost as if billing the Lumia 735 as a ‘selfie phone’ does it a disservice. There’s no denying that it’s one of the most competent devices in the space for this sort of thing, but it can do and offer so much more. For the £220 SIM-free price tag, there’s little that offers the same level of quality across so many areas; screen, imaging, productivity, connectivity and services. It’s not perfect and we’d have liked a sharper camera, a hardware shutter and perhaps better quality audio recording and playback, but for the most part, there’s little that can touch the Nokia Lumia 735 across the board. Enterprise buyers who've settled on Windows Phone, and who are looking for a good, low cost, and reasonably future-proofed fleet phone should take this very seriously. The Lumia 730 and 735 are now available, the 4G Lumia 735 for £199.95 SIM free at Carphone Warehouse and on contracts under £20, which is very good value. If you see it slip to £150, bite the proverbial hand off. Microsoft's not the only one with a 'selfie phone' now on the market, but this is a solid enough handset with a reasonable price. It all depends on what you want out of your smartphone; if you're not so face-focused, you're probably better off coughing up a bit more for Microsoft's other 'affordable' phone of IFA, the Lumia 830. Nokia, now Microsoft Devices, is all about offering a range of devices to suit a wide range of people, but with a strong focus on the mid- to lower-range of smartphone users. Acknowledging it still has a lot of work to do to create a high-end device people want in the same way they do a new HTC or Apple iPhone. The Nokia Lumia 735 targets the young and trendy and even the young at heart and claims to be the first of its kind; a smartphone specifically designed for selfies. The Lumia 735's design is lighter and thinner, though rather similar to its predecessor's. It has a plastic build that comes in bright eye catching colours of green, orange, grey, white and black. Its 4.7 inch display has a resolution of 720p. The Lumia 735 includes a 5 MP camera as its selling point. This ties in to its branding as a “selfie” phone to give us the mug shot we deserve. The camera also works well for high video quality skype conversations. Just like the Lumia 720, the Lumia 735 comes with Qi-based wireless charging. Rather than fiddling with tedious cables, you can just set your Lumia on a charging plate. One drawback on the Lumia 735’s design is the lack of a dedicated camera key, especially considering that it is a phone that is dedicated to take selfies spontaneously. If you plan to take a lot of photos, you will also need to fork out for an additional micro SD card to make up for the 8 GB internal storage. Qualcomm Adreno 305: Integrated mid-range graphics card in the Snapdragon 400 and S4 Plus SoCs that supports OpenGL ES 3.0 and features unified shaders. These graphics cards are not suited for Windows 3D games. Office and Internet surfing however is possible. » Further information can be found in our Comparison of Mobile Graphics Cards and the corresponding Benchmark List. 400 MSM8926: ARM Cortex-A7 Quad-Core clocked at up to 1.2 GHz, manufactured in 28nm. Supports LTE.» Further information can be found in our Comparison of Mobile Processsors. This is a typical smartphone diagonal. Nokia: The Finnish enterprise is one of the most important telecommunication companies and well-known for mobile technologies. The company started with netbooks in 2009. 79.63%: This rating is not convincing. The laptop is evaluated below average, this is not really a recommendation for purchase.